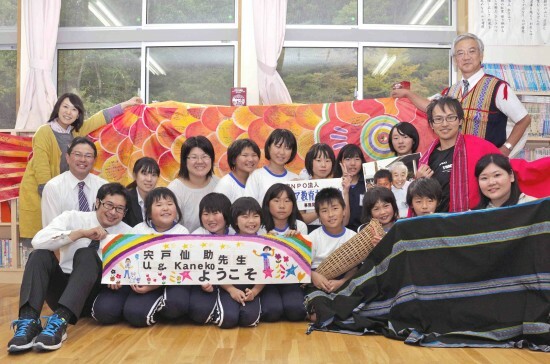 Aono Elementary School students show off the carp streamer covered with handwritten messages by American school children. Sensuke Shishido is holding the banner on the right side. Sensuke Shishido was a public elementary school principal in Fukushima Prefecture when the Great East Japan Earthquake struck in 2011. In April 2014, he visited schools in Southern California and Arizona to raise awareness about children in Fukushima. The Rafu Shimpo reported on his speaking tour in the May 20 edition. Three years and nine months have passed since the Great East Japan Earthquake and the devastating accident at Fukushima Daiichi nuclear power plant. This was an accident that really should not have happened. Tokyo Electric Power Company (TEPCO) has announced that operations to remove the melted nuclear fuel from the Unit 1 reactor will be delayed for another five years. The serious issue of contaminated water is still nowhere close to being solved. Bags of contaminated soil removed from Fukushima elementary and junior high schools after the accident are still kept underground on school premises. People have recently discovered that these bags will not be taken to an interim storage facility that is slated for construction within Fukushima Prefecture. In such a deadlock situation, there are people who have chosen to continue living in an area where the radiation readings are relatively high, knowing the health risks of radiation. Then there are those who have chosen to leave their loved ones, hometowns, and memories behind. No matter what their choices may be, every day is still very difficult for the people of Fukushima. But they cannot live from day to day constantly thinking about the nuclear accident, the health risks and damage. Unless they try to make an effort to forget, life will be difficult and painful. That is why they hide their feelings and try not to worry, if even for a moment. That is also why talking about the nuclear accident or the effects of radiation among people who live in Fukushima or those who come from Fukushima has become taboo. After my trip to the U.S., I visited elementary, junior high and senior high schools in Fukushima. 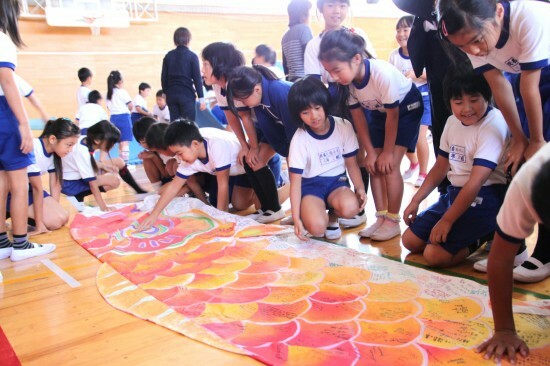 I showed the students the red carp streamer covered with warm messages from the students of Dwyer Middle School, Harte Elementary School in Long Beach, Huntington Beach High School, Chapman University, and Peak School in Flagstaff, Ariz., hoping to cheer up the Fukushima children. At the end of October, there was an election for Fukushima governor. It was a race between six candidates who gave their views on the situation after the accident and what they can offer for the future of Fukushima. The problem with this election was not about who won the election, but the low voter turnout, which was only 45.85%. It was the second-lowest ever for Fukushima’s gubernatorial election. Although people in Fukushima have received so much support and encouragement from Japan and the world, more than half the residents did not make it to the voting station. That was a huge disappointment for me. But what concerns me even more is the emotional well-being of the children who must live among many adults who seem to believe that no matter who becomes the governor, this reality will not change. So what can we do in this situation? When I was in the U.S., I went to see the uranium mines at Grand Canyon. In the highlands of central Vietnam, people still suffer from dioxin used in Agent Orange. There are many countries in the world with problems involving polychlorinated biphenyl (PCB) and asbestos. These issues are considered global environmental issues and nuclear accidents should also be regarded as such. The international community, therefore, needs to play a role in finding a solution for such a grave nuclear accident. I am hoping that the aim of the “nuclear accident child victims’ support law,” which is to protect our children from unnecessary exposure to radiation, will be taken into consideration and that the international community will continue to extend its support. Meanwhile, I feel that my job is to do whatever I can for the children of Fukushima, who are still in a difficult situation. I would like to continue telling people about the need of having “traveling classrooms” that will allow children to spend some time outside of Fukushima as part of school education. I also want to organize more classes and events that will give children dreams and hopes for their future. To do this, I expect to keep my base in Japan and work within the local area. Students of Minami Soma Kashima Elementary School reading the messages from American students. I can tell that Shishido cares greatly for both students as well as his fellow Japanese. I wish others would be willing to travel and speak out as he is. It would be so much better if he spoke from intelligence instead of misperceptions. Trusting the media for accurate information about the incident at Fukushima Da-Ichi only sows seeds of doubt or uncertainty, further destroying the harmony once found in many of the surrounding towns. Most media outlets exist to make money – not reassure the public with truthful insights. The Tsunami victims deserve much more help than they are getting. The distraction of a nuclear incident is delaying cleanup and reconstruction. A significant portion of Japan’s eastern coast is still in ruins, and will remain so until fear is replaced with understanding. The great majority of those that fled out of fear of radiation should have been reassured and encouraged to return back in April of 2011: they are victims of misinformation and a continued propaganda of uncertainty & doubt (as if surviving earthquakes & tsunamis weren’t enough). The administration of PM Kan did them a great disservice. Experts recommended by SARI (Scientists for Accurate Radiation Information) and HPS (Health Physics Society) should be invited to speak with school staff, students, and parents. It will be difficult for those affected to rebuild as long as the popular media keeps them needlessly fearful. ChrisB is correct. Please help the children of Fukushima by getting them accurate information.